Project Report on "STUDY OF CUSTOMER PREFERENCES IN CHOOSING BIG BAZAAR" examining the factors that is affecting the choice of customers in choosing a retail stores. Also "Big Bazaar Project" allows MBA students to understand factors that retain the customers who visit Big Bazaar. This study of Big Bazaar - Marketing Strategy and Customer Preferences focuses on analyzing the consumer’s preferences of the specific attributes of retail store. The research is applicable in the area of customer decision making process for purchasing of products at Big Bazaar. It is required to find out the preferences based on certain aspects (price, Income, levels selection of products satisfaction level of customers). Checkout 1329 Project Topics and if you are interested in Licensing Project Report, MBAnetbook offers MBA Notes and MBA Project to blog readers. 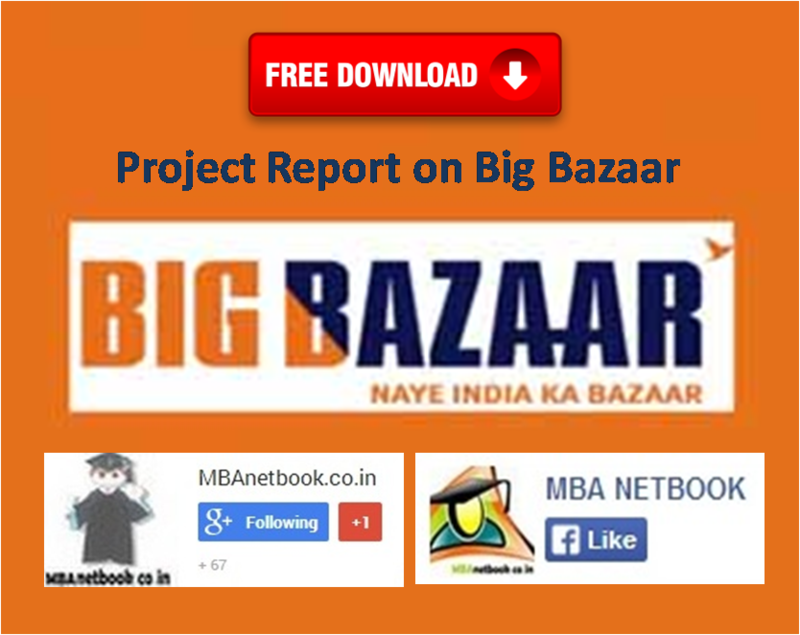 "Project Report on BIG BAZAAR"
Download and get started today—it's free! ... If you are having technical issues or have any questions, we're here to help.